Boilers or generators are equipments that, by applying heat produced by the combustion of fuel which can be liquid, gaseous or solid, heat water till boiling temperature (in hot water boilers), or over 100ºC (in high pressure hot water boilers), or finally, they can produce a change of state from liquid to gaseous, in steam boilers. In thermal fluid boilers, heating is carried by other heat fluids different from water. 1) Hot water boilers: Those in which the heat carrying fluid is water, and the heating temperature does not exceed 100ºC. 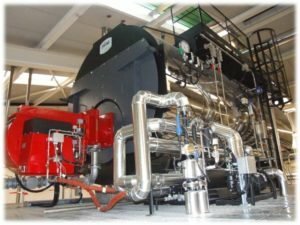 2) High pressure hot water boilers: Those in which the heating is over 100° C. These can be water-tube or fire-tube, depending if it is water flowing into tubes or smokes. Water-tube technology development, make them the most common. Evidently, these boilers have an operating pressure over the atmospheric one, to avoid that water boils when reaches 100°C. Operating temperatures up to 150ºC and pressure of 5 bar are usual in these equipments. 3) Steam boilers. Those in which the carrier liquid is steam. They can be water-tube or fire- tube. The most common are those of saturated steam. The service pressure has to be increased to reach a higher service temperature, there being a relationship between both, as per the steam saturation curve. 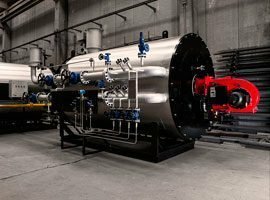 By steam superheaters you can get superheated steam boilers, ie, temperatures above the saturation pressure. Generically the above four categories can also generate heat without any fuel combustion. We are speaking about electric boilers which, that similarly can generate by resistances hot water, steam, superheated steam or can heat thermal fluid. 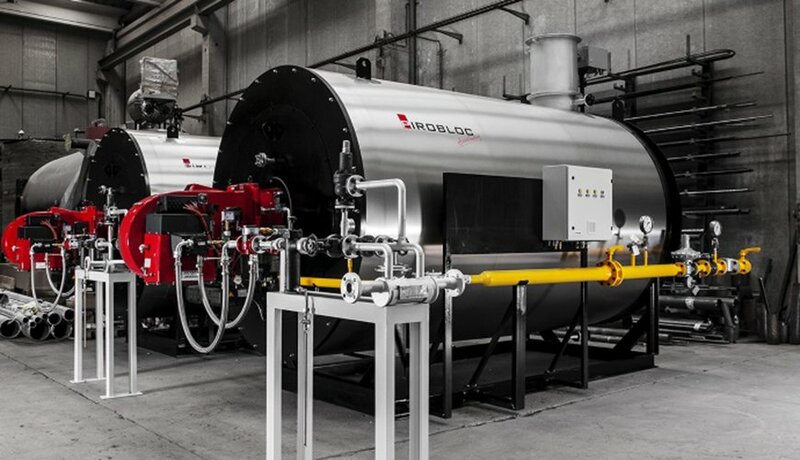 In Pirobloc, we are specialists in the thermal fluid technology, and we take part in all the steps, from consulting till the implementation of one equipment, so that you get the maximum efficiency, security and reliability. Please fill the information form or simply call us and we will be pleased to advise you.